Marvin Windows and Doors are custom-made just for you, so you won't find them stacked at your discount home center. The Built Around YouÂ® philosophy comes through in better crafting, earning a superior reputation among custom builders and architects. Marvin Windows and Doors are custom-made just for you, so you won't find them stacked at your discount home center. The Built Around You® philosophy comes through in better crafting, earning a superior reputation among custom builders and architects when a custom solution is required. Our engineering and manufacturing resources are adept at solving complex issues when custom building products. Wood windows and doors give you the flexibility to change finish and color to match any decor. Their beauty stands up better than vinyl to sun, extreme temperatures, and time. And their warm, rich look increases the aesthetic and market value of your home. Our products are made from the highest quality wood. If you want a special window from a wood other than pine, Marvin can build it. Once your order is received, we begin the process of custom building your products. 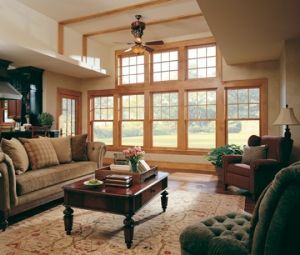 While your windows or doors will be delivered in the same timeframe as a mass produced manufacturer, you'll get the quality materials and craftsmanship that can only come from a custom-made product. If you're doing new construction or a major remodel, let our experience guide you.